Oil pastels and oil sticks are both excellent media to work with for rich color, immediacy, convenience, and achieving a variety of effects. They are perfect for traveling and plein air painting. While they are both made of oil, wax, and pigment, there is an important difference. The main difference is that oil pastels are made with a non-drying mineral oil, so never completely dry, whereas oil sticks are basically oil paint in stick form, made with linseed or safflower oil, and will eventually dry and cure like oil paint, developing a firm skin and hardening throughout. Oil pastels were first created in 1925 by the company, Sakura. They were called Cray-Pas as they were a cross between wax crayons and soft pastels, hence cray-pas, providing the color and brilliance of soft pastel without the mess. Whereas soft pastels are made from a gum or methyl cellulose binder, oil pastels are made of pigment combined with a non-drying mineral oil and wax binder. In 1949 Henri Sennelier created the first version of oil pastels for professionals after artist Pablo Picasso approached him two years earlier asking Sennelier for "a colored pastel I could paint on anything ... without having to prepare or prime the canvas." Although oil pastels harden somewhat, particularly in cooler temperatures, they never completely dry on the painting and remain the same viscosity throughout the layers of paint. Unlike oil paint, or oil sticks, they do not dry by oxidation (exposure to air), so do not develop a hard skin and cure. Although they do not smudge nearly as easily as soft pastels, finished paintings will still need to be protected by glass or varnish if you want to protect them completely from smudging and dust, particularly if you use thick layers of oil pastel. Although you can purchase less expensive student-grade oil pastels that are suitable for use by children in the classroom, for more painterly pastels - those that blend more easily and that provide you with the full potential of oil pastel - it is good to spend more money on professional grade oil pastels. These have a higher pigment to binder ratio and are creamier, going on to the support more smoothly. Sennelier, Holbein, and Caran d'Ache are some of the best brands. See this article about different brands of oil pastel. Professional grade oil pastels are non-acidic. If combining brands within the same painting it is best to keep it within the same quality range. Oil pastels can be used on practically any surface, smooth or rough, depending on your own preference. They can be used on such surfaces as watercolor paper, pastel paper, drawing paper (the thicker the better), canvas (primed or unprimed, although it should be sized) wood, metal, even glass. It is good to work on a firm support, though, so either work on a pad or put a backing such as foam core behind your paper or canvas while you work. Ampersand Pastelbord (Buy from Amazon) comes in several different colors and is an excellent surface on which to paint with oil pastels. You can use many different tools for blending oil pastels, even your fingers. In fact, body heat from your fingers is useful in warming the oil pastel and making it more malleable. You can also use tortillons, or blending stumps (commonly used in drawing), paper towel, tissue, q-tips, soft cloths, and stiff brushes. Sennelier makes an Oil Pastel Colorless Blender (Buy from Amazon) that is very useful for blending. For sgraffito techniques, you can use many different tools, such as paint shapers, the end of a paintbrush, palette knives, or other pointy tools. An old plastic credit card can be used to scrape off larger areas as well as finer lines. Combs and forks can be used to create patterns in the oil pastel. Oil pastels can be layered, although because they don't dry there will be some blending of the color as you layer. You can control the amount of blending by the amount of pressure you apply in your stroke. Oil pastels can be combined with oil painting mediums such as linseed oil and thinners such as turpentine or turpenoid (an odorless turpentine) (Buy from Amazon) for different blending and painterly effects. Oil pastels can easily be cleaned up with paper towels or baby wipes for your hands. It is good to have paper towel on hand to clean the pastel sticks as you use them to help keep your colors pure. For plein air painting in warm weather keep your oil pastels in a cooler with ice if the temperature gets above 80 degrees in order to keep the sticks from melting and becoming too soft. Because oil pastels will never completely dry they should be sealed when finished. Sennelier D'Artigny Oil Pastel Fixative (Buy from Amazon) is a sealant specifically made for oil pastel. After four light coat applications, it protects your oil pastel painting from smudging, scratches, and dust. It has a glossy finish and is totally transparent, so does not alter the colors of the painting. It makes the painting feel dry by creating a barrier layer on top of the oil pastel painting. There are other brands available but you should test them out before applying them to a finished painting. Some may alter the color slightly or interact with the type of paper or brand of oil pastel that you use. Make sure to follow the directions on the fixative can and spray only in a well-ventilated area. For maximum protection of your oil pastel artwork, you should frame it behind glass or plexiglass. Oil sticks (also called paintstiks or oil bars by some manufacturers) are actually oil paint in stick form. They feel and smell more like oil paint than do oil pastels. They consist of pigment combined with wax and linseed or safflower oil (as opposed to non-drying mineral oil as in oil pastels), and then rolled into crayon form. They are then wrapped in paper and can be used for drawing and painting on a surface just as they are, mixed on a palette and applied with a brush or palette knife, or mixed with any medium or thinner you would typically use with oil paints. The oil stick medium dries like oil paint and develops a solid skin on its surface as it dries, sealing the wet buttery paint underneath. There is some controversy, though, as to whether the paint dries completely and cures (dries completely through) over time as oil paintings do, or whether the wax in the oil stick prevents it from drying completely. Because the surface of the oil stick dries, it will also dry between uses, preserving the paint beneath it. The hardened tip can easily be rubbed off with a towel or rag, or peeled off with a palette knife to expose the softer paint underneath. Oil sticks generally come in larger sizes than do oil pastels and are priced more like tubes of oil paint. Specific ingredients and concentrations vary by manufacturer but, like oil paints, more expensive oil sticks generally have a higher pigment to binder ratio and are creamier. R&F Pigment Sticks (Buy from Amazon) are a popular brand, as are Sennelier Oil Sticks (Buy from Amazon), Shiva Paintstiks (Buy from Amazon), and Winsor & Newton Oilbars (Buy from Amazon). Read a review of these four brands here. Oil sticks can be used on any surface that is also suitable for oil paint. Canvas or paper should be sized and primed to protect them from damaging effects of the oil. Can Oil Stick, Oil Pastel, and Oil Paint Be Used Together? 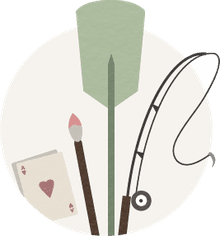 Oil sticks, oil pastels, and oil paints can be used together, but if you are interested in archival quality there are some guidelines you should follow. Oil sticks, oil pastels, and oil paints are compatible, but it is best in a mixed media piece if one media is dominant, and other media are used as accents or details. This will help the structural integrity of the piece. If using oil sticks or oil pastels as a first layer, use them thinly as an underpainting or drawing for an oil painting. Use the colors that you will be using in the painting. As you paint with the oil paint over it, the medium in the oil paint will help dissolve the oil pastel or oil stick and blend it in with the oil paint. Because oil pastel never really dries completely, it should generally be used as detail or accent color either with thin oil paint so that it dissolves into the paint, or on top of oil paint that has dried. Oil paint should not be painted over thick oil pastel because the oil pastel will never completely dry and will remain workable and unstable, possibly causing cracking and flaking of the oil paint layer. You can combine oil pastels and oil sticks, particularly if you use the oil pastels for final details and accents. It is possible to combine both media when wet, although archival quality will be compromised. The ratio of oil pastel to oil stick, which is paint, will influence drying, so you may need to frame the final piece under glass or plastic. Oil sticks can easily be used with oil paints because they are, in fact, oil paints in stick form. However, you should consider them to be "fatter" than the paints due to the wax content. They will dissolve with whatever medium and thinners you normally use with oil paint. 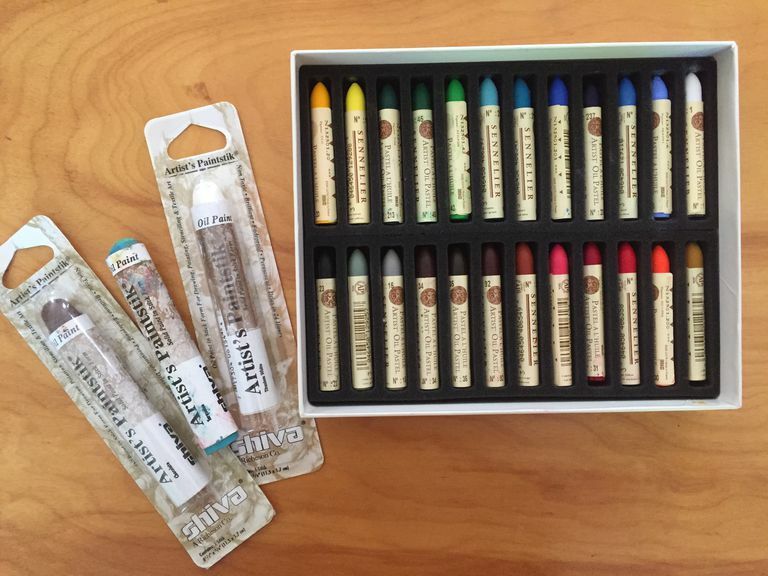 Oil pastels and oil sticks are both versatile media for the professional artist. Oil pastels are made with mineral oil and never dry completely, remaining workable forever, unless sealed with a fixative. They should be framed under glass or plexiglass for maximum protection. Oil sticks are basically thick oil paint in stick form and dry completely over time just as oil paints do. They do not need to be under glass and can be varnished with varnish appropriate for oil painting. Think fat over lean, or thick over thin, when using both oil pastels and oil sticks. Save your heavy impasto layers for later in the painting. Both oil pastels and oil sticks are good to use thinly for drawing and sketching out a painting in oil, using the colors you plan to use in your oil painting. You can draw with both oil pastels and oil sticks directly onto many different surfaces, preferably a support that is treated to protect it from the oil in the oil stick (not necessary for the inert mineral oil in the oil pastel). If using both oil pastels and oil sticks in the same painting, or with oil paint, it is best to use the oil pastels on top of the dried surface of the oil sticks or oil paint as an accent or detail.